No long ago this blog reported on an allene vs zwitterion debate featuring Bertrand & group vs Christl & Engels (here). The fundamental question is if cylic allenes can exist despite built-up of strain energy and if so whether the central carbon atom in the allene can be zerovalent with proper substituents. The Bertrand-yes team have now come up with an even smaller cyclic allene than the one they created to start the debate (Melaimi et al. DOI). 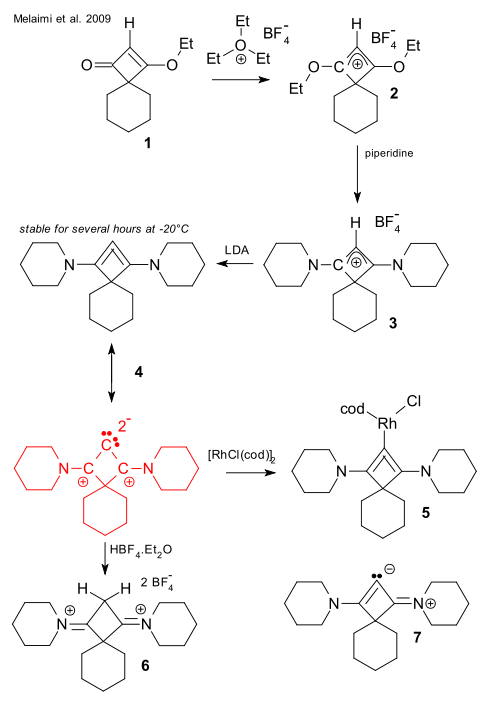 Starting from spiro compound 1 , triethyloxonium tetrafluoroborate adds an ethyl cation in 2, the ethoxy groups are replaced by piperidine in 3 and finally the proton is removed by LDA to cyclobutane allene 4. The reaction product with (RhClcod)2 , 5 can be isolated. The allene is found to be a strong donor ligand. Reaction with tetrafluoroboric acid gives the dication 6 which supports evidence for the two lone pairs on the central carbon atom. These two findings do not support the alternative zwitterion 7 that could perhaps be favored by Christl & Engels. Update (July 26): Hanninen et al. (DOI) find by computation that when an allene is bent the central carbon atom becomes a carbene with two pi electrons delocalized on the adjacent carbon atoms. No longer an allene then!